Ya’ll…..my mouth is still watering. This recipe turned out SO much better than I ever expected and it was all created on a whim. I am always on the lookout to clear the fridge to make a good meal, and the other night I rummaged up onions, baby bella mushrooms, pecorino romano and gorgonzola cheese. The only protein I had thawed out was chicken breast and decided to experiment. 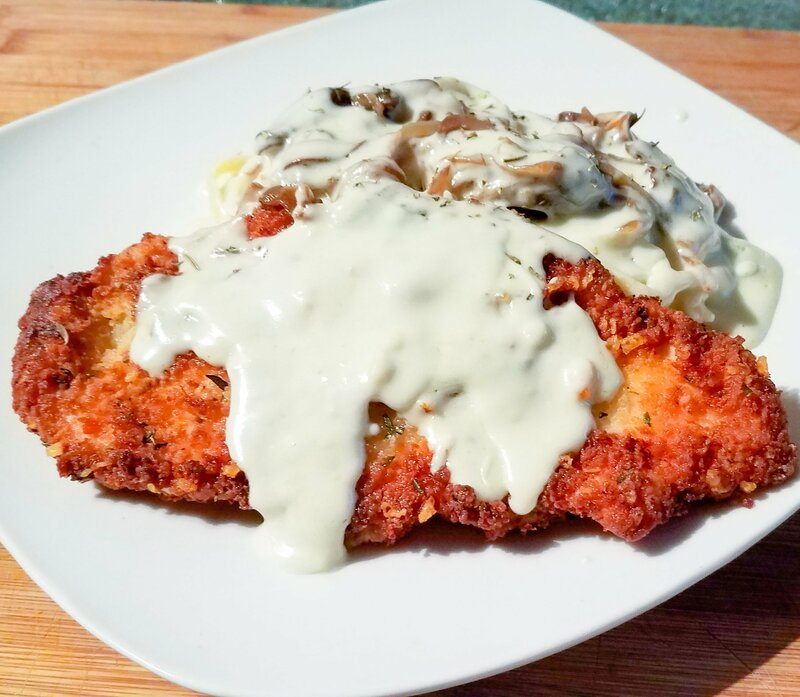 I had a sprig or two left of rosemary as well as dried thyme and came up with an herb crusted chicken breast topped with gorgonzola pecorino romano cream sauce along with caramelized onions and sauteed mushrooms. 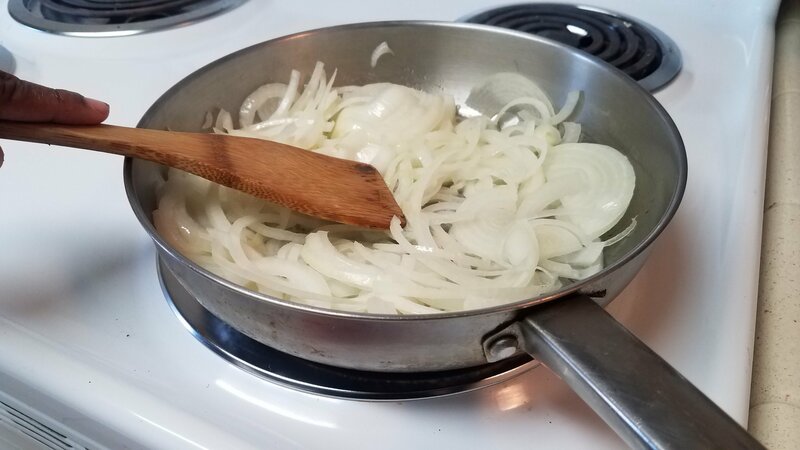 First slice an entire onion thinly and add it to a pan over medium heat with a tablespoon of oil and butter. Slow over low heat will ensure all the sugars caramelize the onions without burning. Let the onions sweat and caramelize for about 20 minutes until they turned golden and then toss the thinly sliced mushrooms in the pan and let them reduce down for about 5-8 minutes. 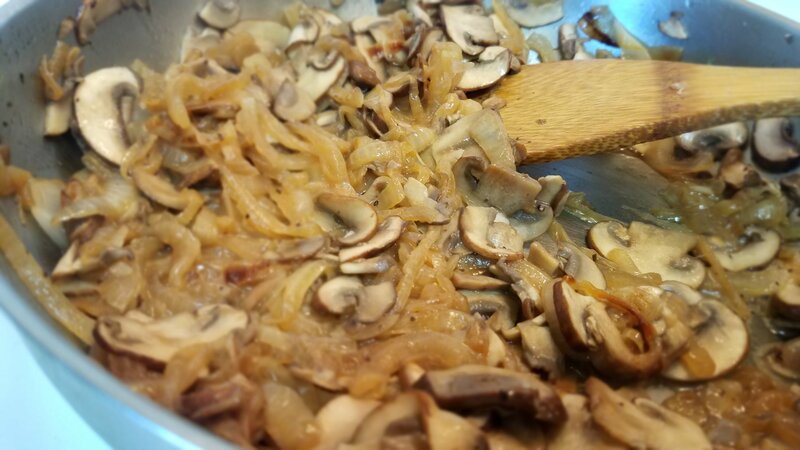 Caramelized onions and mushrooms add a nutty and protein flavor packed punch to a variety of meals! 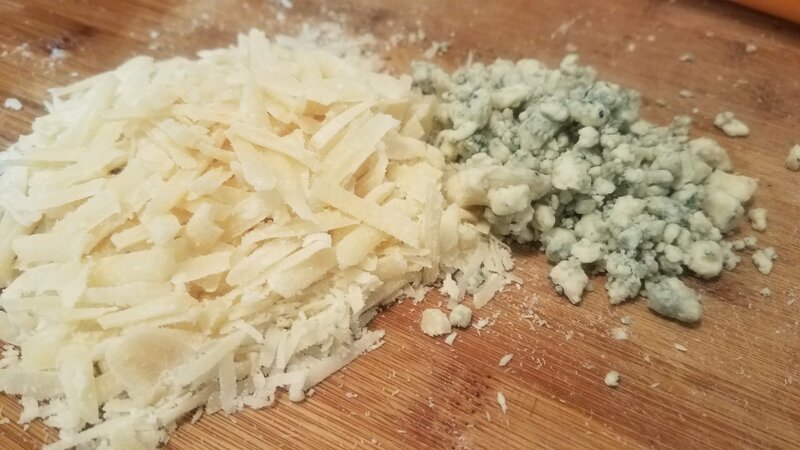 As the mushrooms and onions are cooking, I grated about a 1/2 a cup of pecorino romano cheese and set that aside in a bowl with 1/4 cup of gorgonzola cheese crumbles. 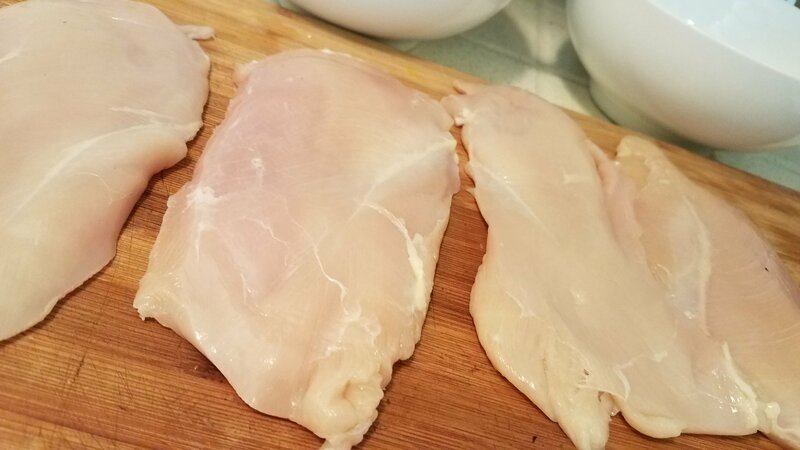 Now grab two chicken breast and slice them in half, ridding of any gristle or white tendons along the way (EWWWW NO ONE NEEDS THAT IN THEIR LIFE!) I placed the chicken in a Ziploc bag, grabbed a frying pan and beat them breasts like they owed me money folks (this is the best way to take out the days frustrations if you ask me). 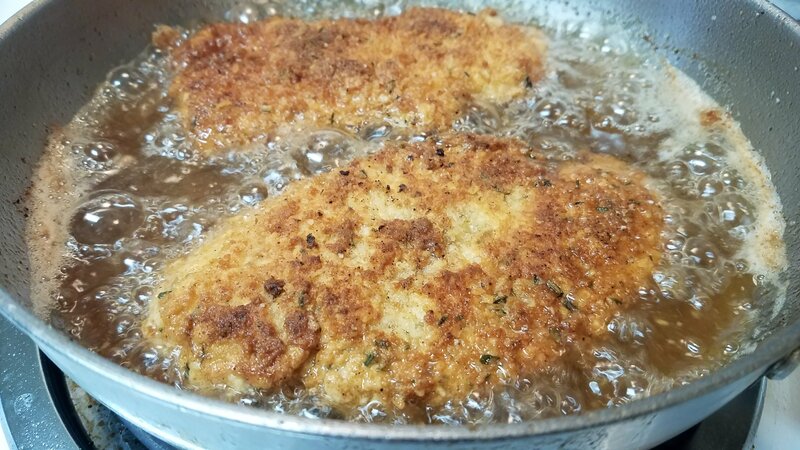 Fill a medium sized frying pan with just enough oil to fry the chicken (about a 1/2 cup or a little more) and set the pan over medium high heat. 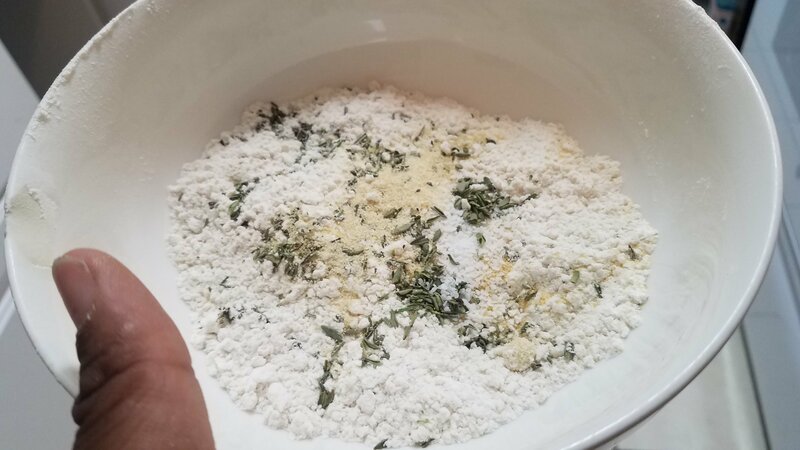 Grab a medium sized bowl and add the flour, panko breadcrumbs, salt, pepper, a handful of pecorino, garlic powder, onion powder, thyme and rosemary. Add one egg and a 1/4 cup of milk to another bowl and set up an assembly line as follows: Flour —>Egg/Milk—>Clean Plate. To get the chicken EXTRA crispy you are going to dip it in the flour, egg mixture next, BACK into the flour mixture and onto the clean plate. When the oil is up to temp, fry the chicken for about 3 minutes on each side and then set them inside a oven at 200 to keep warm. All hail the GLORY that is pan fried herb crusted chicken. 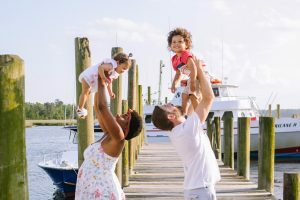 This is going to be a new staple in our house for sure! Boil your pasta according to the directions on the box and drain when done. Now onto the glorious cream sauce that makes this entire dish. 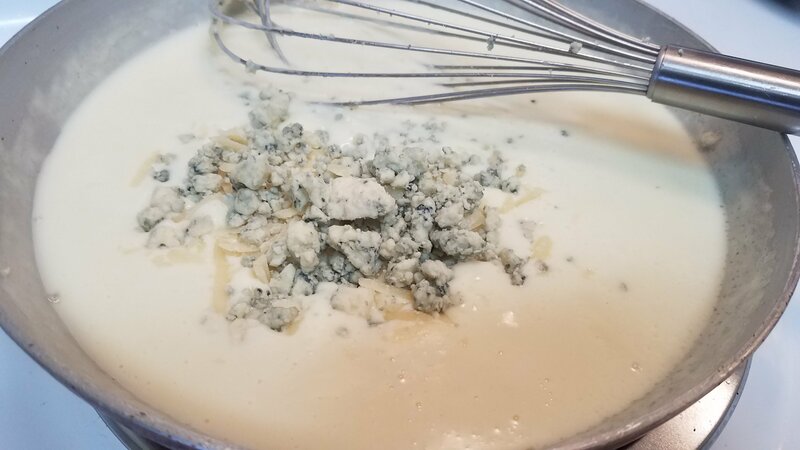 Make a roux in a pan with butter and flour, making sure to whisk until its a nutty color and add a half a cup of heavy cream. Continue whisking over low heat and just as it starts to bubble, add half a cup of chicken broth (this is my secret ingredient in sauces). This adds so much flavor and eliminates the need for much salt). Add up to 3/4 of a cup of broth to get the right consistency if needed! 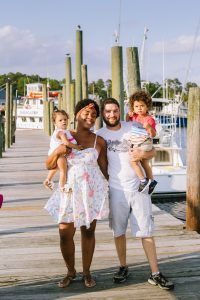 Better than Bouillon base is affordable and lasts FOREVER. 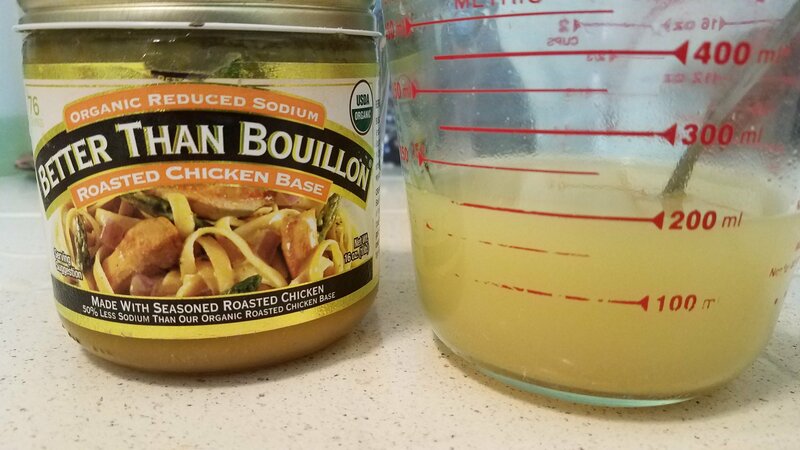 I use a lot of chicken broth so this saves me so much money!!! When the sauce begins to thicken, take it off the heat and whisk in all the glory that is CHEEESEEEEEE. Can I just dive in this silky sauce and stay for a while? 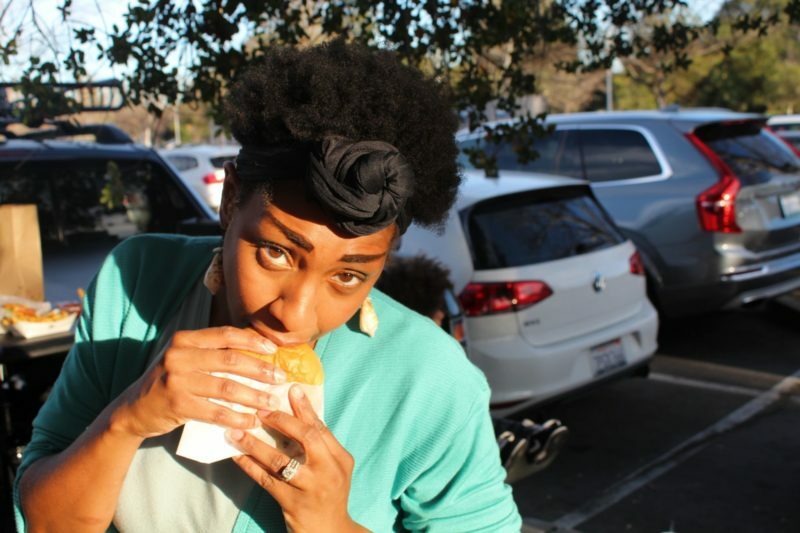 My thighs say no but…I’m gonna do it anyways! Plate your pasta, top with chicken, mushrooms/onions and the amazing cream sauce and VOILA….dinner is served! If you have any questions please leave a comment or email me directly at themaedaychronicles@gmail.com! I hope you enjoy!